I have a huge collection of music compact disks (CDs), none of which have been played in the past year. When music CDs were introduced they were much more convenient than phonograph records, and sales of phonograph records steeply declined. Likewise, digital music files are much more convenient than CDs, so it's now hard to find music CDs. I think my last music CD purchase was twenty years ago from an actual brick-and-mortar record store. There are presently no record stores in my area, since nearly all music is procured online. One CD in my music collection is Diamond Music, a 1996 compilation of music by composer, Karl Jenkins. This music was used in a series of diamond gemstone commercials of that time that had the helpful recommendation that a diamond engagement ring should cost two month's salary. The sentiment that Diamonds are Forever was used in those commercials, and this was the title of a much earlier novel by Ian Fleming and a James Bond film. While the negative energy indicates a favorable reaction, an activation energy must be overcome before the reaction initiates. For this reason, diamond will only ignite at a temperature of 850-1,000 °C in air, or 720-800 °C in pure oxygen. In 1772, Antoine Lavoisier used a lens to focus the Sun's rays onto a diamond in an oxygen atmosphere to heat it sufficiently to produce carbon dioxide. Diamonds are not forever, and they're often imperfect. They can contain atoms other than carbon in their crystal lattice. This figure shows a nitrogen atom (red) combined with a vacancy (yellow) to form a color center in diamond. This defect produces a local negative charge that produces a red light photoemission from visible light excitation. Technology is disrupting many established markets, from taxicabs to television, and it's now disrupting the diamond market. Many of today's young people don't subscribe to the two month's salary diamond, and there are now synthetic diamond gems available for half the price of a mined diamond, $4,000 per carat, rather than $8,000 per carat. Diamond marketer, De Beers, the "Diamonds are Forever" corporation, has always argued that synthetic diamonds are somehow inferior to mined diamonds to justify the higher price of mined diamonds. Seeing how synthetic diamonds are eroding the $80 billion diamond gem market, De Beers has recently announced that it will also supply synthetic diamonds. De Beers is still claiming that synthetic diamonds are inferior, so much so that their synthetics will be sold for about $800 a carat. Many commentators claim that De Beer's sole motivation is to disrupt the synthetic diamond market, as this low price surely will, as well as to underscore the idea of the supposed inferiority of synthetic diamonds. De Beers says that its synthetics will not be graded for color and clarity, as are mined gems, which is apparently another marketing ploy. Synthetic diamonds are often superior to mined diamonds in such grading, since an industrial process can be well controlled and mined diamonds are a product of the vagaries of nature. One of my crystal-growing colleagues was certified as a diamond appraiser by the Gemological Institute of America, possibly as a hedge against diminishing employment among crystal-growers in the US. Nature imitating geometry - A scanning electron microscope image of a synthetic diamond cuboctahedron. A cuboctahedron has 8 triangular faces and 6 square faces. Such a polyhedral shape arises from the different growth rates on different crystal facets. The melting point for diamond, of course, applies only in an atmosphere devoid of oxygen. The tensile strength of diamond could be as high as 90 GPa in the  crystal direction, and 225 GPa in the  crystal direction. It should be no surprise that diamond has a very small compressibility. While a sheet of glass will break when too much bending force is applied, a glass fiber that's free of defects will bend to a very small bending radius without breaking. This effect is easily seen in the common thermal insulation material, Fiberglas/fiberglass. 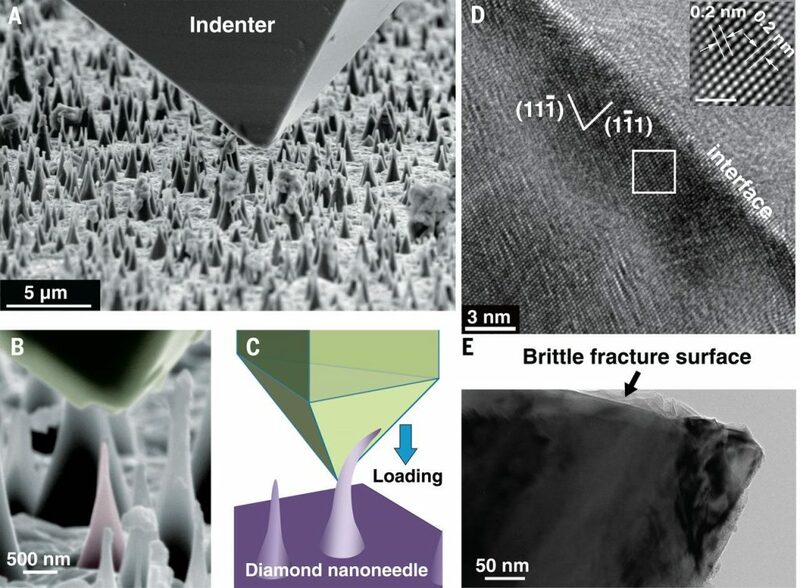 The same is true for nanocrystal needles of synthetic diamond, as demonstrated by an international research team from the City University of Hong Kong (Hong Kong, China), the Massachusetts Institute of Technology (Cambridge, Massachusetts), the Institute for Basic Science (Ulsan, Republic of Korea), and the Nanyang Technological University (Singapore, Republic of Singapore). 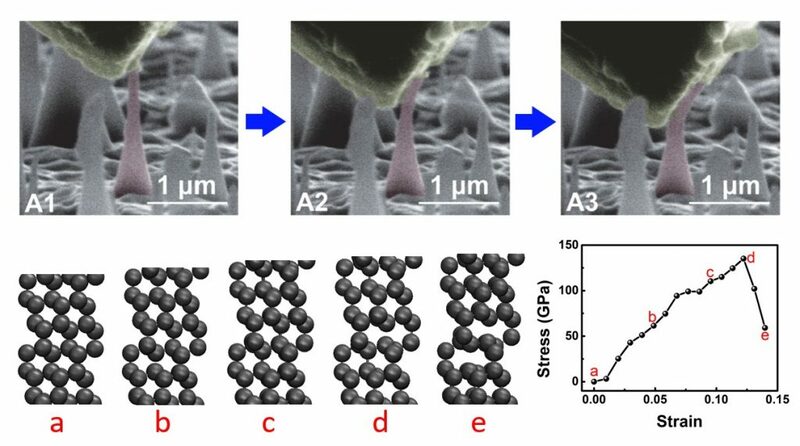 The strain experiments were done by pressing the 300 nanometer needles with the nanoindenter diamond tip of a scanning electron microscope, where they were found to elastically recover from a strain of about 9%. [7,9-10] This strain is close to the theoretical limit for diamond, and it corresponds with a tensile strength of up to 98 GPa. [7-8] Needles presumably free of all defects would strain as much as 12% without breaking. Bending a diamond nanoscale needle in a scanning electron microscope. It was found that even polycrystalline diamond nano-needles could achieve a strain of about half the value, 4%, of crystalline needles. [10-11] The researchers ascribe the high strength of all needles to the small number of defects that can exist in a nanoscale needle and the smooth surfaces of the nano-needles. [7,9] Says Feng Ding, an author of this study and a professor at the Institute for Basic Science, "When outside force is applied to these defects, they can crack and eventually break." It was necessary to use a computer model to derive the material stress from the nonlinear elastic deformation for the diamond needles of the particular shape used in the experiments. The model showed that the maximum local stress was close to the theoretical tensile strength of defect-free diamond. Stress-strain curve for diamond nanoscale needles. Not surprisingly, such an unusual material has some potential applications. First, material properties of highly strained materials are often shifted from their quiescent state. This would allow tuning of such things as mechanical, thermal, optical, magnetic, electrical, and light-emitting properties. In particular, the nitrogen-vacancy emission in diamond, noted in a figure above, should shift in wavelength. There may be a means of using strain to permanently encode data in diamonds optically. Since diamond is a biocompatible material, these nano-needles could be used to deliver drugs into cells. Karl Jenkins and Adiemus-Palladio 1st Movement from Diamond Music, YouTube Video, January 13, 2009. De Beers A Diamond is Forever Commercial (1997), YouTube Video by RetroCommercial.com, March 17, 2011. Free energy data from L. B. Pankratz, "Thermodynamic Properties of Elements and Oxides," U. S. Bureau of Mines Bulletin 672, U. S. Government Printing Office (1982). Thomas Biesheuvel, "De Beers to Sell Diamonds Made in a Lab," Bloomberg, May 29, 2018. Diamond (C) - Properties, Applications, AZO Material Website. R. H. Telling, C. J. Pickard, M. C. Payne, and J. E. Field, "Theoretical Strength and Cleavage of Diamond," Physical Review Letters, vol. 84, no. 22 (May 29, 2000), pp.5160-5163, DOI:https://doi.org/10.1103/PhysRevLett.84.5160. Amit Banerjee, Daniel Bernoulli, Hongti Zhang, Muk-Fung Yuen, Jiabin Liu, Jichen Dong, Feng Ding, Jian Lu, Ming Dao, Wenjun Zhang, Yang Lu, and Subra Suresh, "Ultralarge elastic deformation of nanoscale diamond," Science, vol. 360, no. 6386 (April 20, 2018), pp. 300-302, DOI: 10.1126/science.aar4165 . Javier LLorca, "On the quest for the strongest materials," Science, vol. 360, no. 6386 (April 20, 2018), pp. 264-265, DOI: 10.1126/science.aat5211. UNIST Introduces Novel Method to Grow Elastic Diamonds, UNIST Press Release, April 27, 2018. David L. Chandler, "How to bend and stretch a diamond," MIT Press Release, April 19, 2018. World's hardest material, diamond, is flexible, Nanyang Technological University Press Release, April 20, 2018. Think diamonds are unyielding? Think again, American Association for the Advancement of Science Press Release, April 19, 2018. The 4Cs of nanodiamonds, YouTube Video by Nanyang Technological University, April 19, 2018. Linked Keywords: Music; compact disk; phonograph record; digital audio; digital music file; brick-and-mortar; Internet; online; Diamond Music; composer; Karl Jenkins; diamond; gemstone; television advertisement; commercial; engagement ring; salary; novel; Ian Fleming; Diamonds Are Forever (film); James Bond film; chemist; eternity; eternal; carbon allotrope; combustion; burn; Gibbs free energy; oxide; oxidation; room temperature; kilocalorie per mole; kcal/mole; oxygen; carbon dioxide; negative number; chemical reaction; activation energy; material properties of diamond; ignite; temperature; Celsius">°C; atmosphere of Earth; air; Antoine Lavoisier; lens; focus; Sun's rays; carbon dioxide; atom; crystal structure; crystal lattice; nitrogen-vacancy center; nitrogen; vacancy; F-center; color center; electric charge; negative charge; emission spectrum; photoemission; visible light; excited state; excitation; Wikimedia Commons; Stacylee14; technology; market (economics); taxicab; television; synthetic diamond gem; mining; mined; carat; De Beers; corporation; diamond color; diamond clarity; marketing ploy; industrial process; vagary; vagaries; nature; crystal growth; crystal-growing; colleague; certification; certify; appraiser; Gemological Institute of America; employment; United States; geometry; scanning electron microscope; synthetic diamond; cuboctahedron; triangle; triangular; square; polyhedron; polyhedral; growth rate; crystal; facet; industry; industrial; material; hardness; strength of materials; quantification; semi-quantitative; Moh's hardness scale; mineral; talc; mechanical property; units of measurement; elastic modulus; Young's modulus; pascal unit; GPa; bulk modulus; compressive strength; tensile strength; melting point; oxygen; Miller index; crystal direction; compressibility; glass; fracture; bending stiffness; bending force; glass fiber; crystallographic defect; bending radius; thermal conductivity; thermal insulation; glass wool; Fiberglas/fiberglass; nanocrystal; research; City University of Hong Kong (Hong Kong, China); Massachusetts Institute of Technology (Cambridge, Massachusetts); Institute for Basic Science (Ulsan, Republic of Korea); Nanyang Technological University (Singapore, Republic of Singapore); stress mechanics; deformation mechanics; strain; silicon; wafer; substrate; biasing; bias-assisted; chemical vapor deposition; plasma etching; plasma etch; nanometer; nanoindenter; scanning electron microscope; theory; theoretical; nanoscopic scale; nanoscale; crystallite; polycrystalline; Feng Ding; author; professor; computer simulation; computer model; linearity; nonlinear; experiment; stress-strain curve; quiescent; mechanics; mechanical; temperature; thermal; optics; optical; magnetic; electronics; electrical; light-emitting diode; wavelength; read-only memory; encode data; piocompatibility; biocompatible; pharmaceutical drug; cell.